This was our one sleep-in today, and somehow my body woke me up at 8am. Which is a sleep-in compared to 6.30am, but still! I would have preferred to sleep a little longer. But it did mean that I could download some episodes of Ugly Duckling for the journey home. I also got to breakfast in time (toast and coffee if you were wondering). There were some University students there as well. I’m not entirely sure, but either they had to be in their uniform to vote or they probably had an activity to do at university. We checked out at 12am and walked over to the Bus Terminal. This weekend had to be the most that I have walked since Chiang Mai! 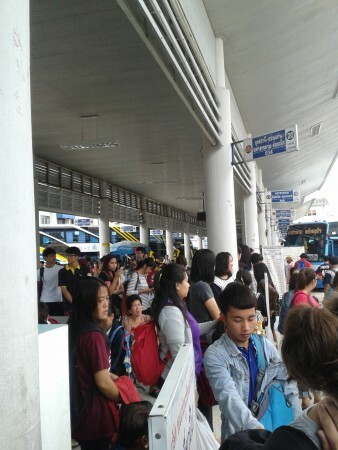 When we got there, we found out that the next bus going straight to Ubon Ratchathani which wasn’t full was at 5pm. So instead we decided to go via Sarakham, like we did on the journey to Khon Kaen. Thankfully it didn’t include an impromptu night in Sarakham this time. We joined the queue for tickets and the women pointed to the number and said to wait for that bus. So we waited. We waited for an hour or so after the bus was meant to come. After becoming tired and grumpy from waiting in the packed Bus Terminal, I approached someone and asked where the bus to Sarakham was. He then directed me to someone who spoke more English and he directed me and the other three to the bus. As much as he said it was to Sarakham, I was a little doubtful. But I do not think we could all bear to spend another minute in that station. Thankfully an hour and a half later we did arrive in Sarakham. We then went to hunt for a bus to Ubon Ratchathani. One company had a bus leaving at 9pm. Another only had three seats left in their bus. But the third bus we were showed to had seats and was leaving reasonably quickly. The only quirk about this bus was the movie that is was showing, and that we had to deal with for the first hour of the journey, was a Thai horror movie. Now I’m not really a fan of horror movies, but this movie was of the kind of quality that you get from a 90s homemade video. We were all grateful when they turned the screens off. We got back to Ubon Ratchathani around 8.30pm and decided to have dinner at the Bus Terminal. I led them to the place I bought my pad thai on Friday and we all had a plate of pad thai each. After we finished we went and queued at the Taxi Rank. We had sat there for at least five minutes when a monk came along. Now in Thailand monks are highly revered and go on air planes first and get first place in the taxi queue as well; which happened to be our taxi. So we decided in that moment that we were going to become a monk if we could. But I looked it up and women can’t become monks, but nuns instead. However nuns aren’t nearly as respected as monks, so it wouldn’t be the same. After 9 hours of travelling we finally got back to our rooms where we collapsed and tried to forget that we had to get up for school the next day.